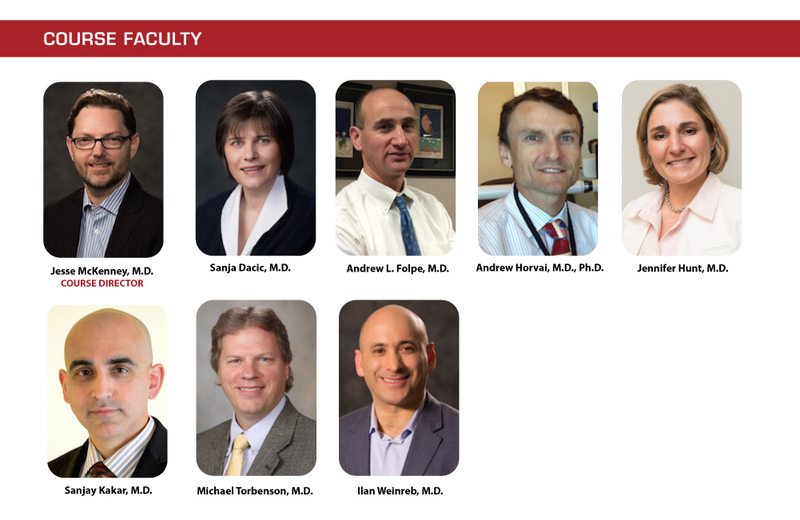 A superb faculty is poised to provide the latest updates in morphology, ancillary studies, molecular pathology and relevant genomic information. While the target audience is community practitioners, the panorama of current topics is important to pathologists of all practice genres, including pathologists-in-training. The United States and Canadian Academy of Pathology designates this enduring material for a maximum of 15 AMA PRA Category 1 CreditsTM. Physicians should claim only the credit commensurate with the extent of their participation in the activity. The following faculty reported no relevant financial relationships: Jesse McKenney, M.D., Sanja Dacic, M.D., Andrwe Folpe M.D., Andrew Horvai, M.D., Jennifer Hunt, M.D., Sajay Kakar, M.D., Michael Torbenson, M.D. and Ilan Weinreb, M.D. To earn CME and SAM credit, all learners must take a content-based exam and achieve a minimum score of 80%. If learners do not achieve a passing score of 80%, they have the option to retake the exam. After you pass the test and complete the evaluation, your certificate of completion will be available to view and print by clicking here . Purchasing as a bundle saves a lot over the individual purchase of each course!